The intense shades of red, blue, and yellow are undeniably strikingly gorgeous and admired by all. The other tertiary hues are equally beautiful, but nothing tickles our fancy like vibrant neon colors. Usually labeled with two names like hot pink, lime green, and laser lemon, these fun colors signify fun and that's it's time to party so bust out these radiant shades whenever a bash is about to commence. These neon shot glasses are helpful drinkware to have on hand. Use them whenever you're having a party, planned or impromptu! The electric hues indicate that fun is about to be had by all. These neon shot glasses are made from plastic and great for all types of parties being held by those 21 and over. 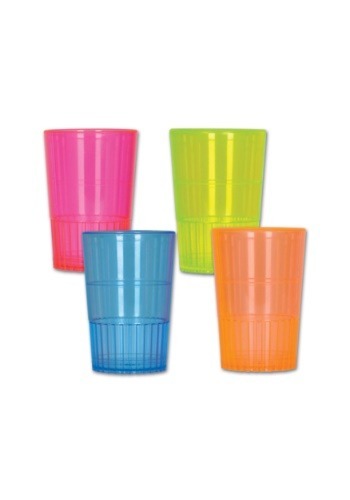 You'll receive 2 hot pink, 2 electric blue, 2 lime green, and 2 atomic orange shot glasses all capable of holding 1.5 oz. of your choice beverage. Pick them up for backyard barbeques, Hawaiian themed luaus, birthday parties, and any occasion that calls for a celebration. If you like these shot glasses then chances are you will like others that we have. Be sure to check out tube shot glasses and mini boot-shaped shot glasses.